Holidays bring social get-togethers, religious festivities, office parties, neighborhood gatherings, family get-togethers, and so many food-focused events that it can feel impossible to stay on track with your health. Fortunately, it is possible to enjoy the holiday season while still respecting your body. Since the best defense against holiday weight gain is a good plan of action, I’ve compiled the following 11 tips for keeping your health on track during the holidays. In the midst of the vast array of goodies, it can be easy to dive in and try a bit of everything, regardless of how much you like the treats. Adopt the mindset of saying “no” to foods and treats that are not your absolute favorites. Go ahead and say “Yes!” to the treat you do love! This leaves room for indulging while still placing some boundaries on how you eat. Before attending a party or gathering, check in with yourself mentally to decide which treats are worth the indulgence. This increases your odds of following through once the time arrives. Do your holiday gatherings typically include a cookie exchange? Consider switching up the focus this year and suggesting a book or ornament exchange instead. Better yet, agree to make cookies to bring to your local police or fire station, food pantry, or other community centers to put spread holiday cheer. If you receive candy, chocolates, or cookies as gifts and do not want to be tempted by them, consider donating them to your local homeless shelter. Another option is the classic “White Elephant” gift exchange. This goofy, unpredictable tradition is guaranteed to get everyone laughing and having fun, no junk food necessary. It’s also extremely simple and great for all ages: Everyone brings a gift of their choice, preferably something unique, memorable, or just plain ridiculous. Each person brings a gift and each person gets a gift (likely a funny one). What’s not to love? It can be hard enough to find time to exercise at any given time of the year, but holidays can prove extra difficult. Fortunately, you can turn your holiday chores and prep work into a stealthy form of working out! Blast your favorite holiday tunes as you sweep, vacuum, and clean. 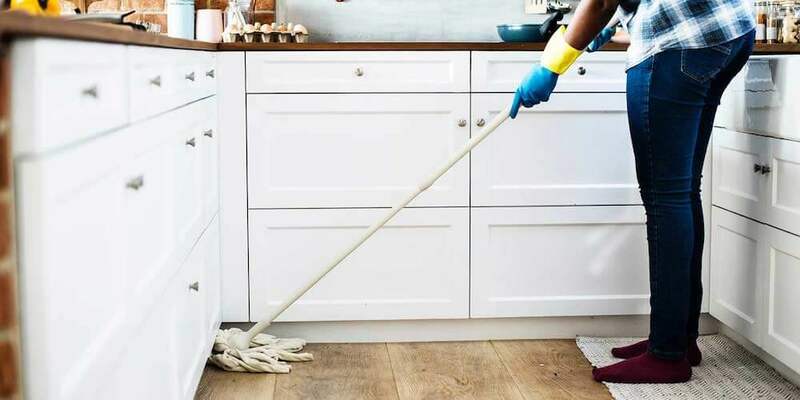 Household chores can burn a surprising number of calories and the seasonal music will make it fun. Now that is multitasking! If possible, plan and host your own party! As a host, you have the opportunity to control the majority of the food choices and even introduce your partygoers to the healthy options you love. You will also stay busier as a host, leaving less time for hanging around by the food tables and being tempted by the goodies. If you are unable to host, consider limiting the number of social gatherings you go to. Commit to the events that are most important to you and skip the rest. Not only will this help you avoid unnecessary temptation, but it will also take some of the ‘hustle and bustle’ out of the busy holiday season. Always start any holiday meal with healthy, filling food choices, such as these. Excellent options include cut vegetables and hummus, a salad, or soup. These foods are filled with vitamins, minerals, and fiber that nourish your body and leave less room for treats and junk. To make sure a healthy option is available, offer to bring a dish to pass. This puts you in control and guarantees that you will have at least one healthy choice. 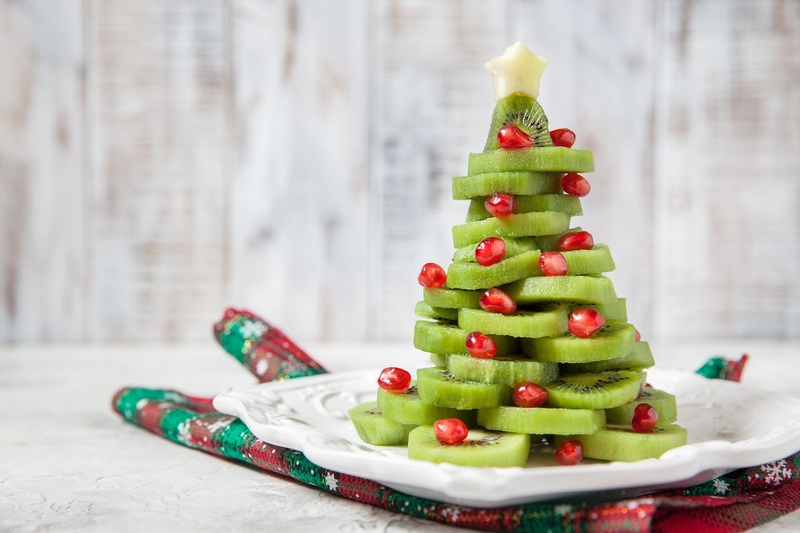 Tip: why not swap some of the traditional sugary, fatty desserts with your own kiwi fruit Christmas tree? Rather than dwelling on the food and treats, try to focus on staying social and connecting with people. Find a group of friends or family members to catch up with (far away from the food table) or plan a group walk or game. Another excellent option is offering to help the host clean up. This takes some of the responsibility off of the host (surely to be appreciated) while preventing you from diving into dessert. With all the excitement surrounding the holidays, it can be easy to get frazzled and reach for your favorite comfort food. Instead, take several slow, deep breaths prior to eating. Focus on the smell, colour, and flavour of the food you are tasting. Another trick for slowing down and remaining mindful is putting your fork down in between bites. Partway through any meals, set your fork down for a minute or two and pause. Take a few deep breaths and take a moment to rank your hunger on a scale from 1 to 10. To avoid ending up with that overly full feeling, stop eating sooner than you think you need to. Research shows it can take the brain up to 20 minutes from the time you start eating to realize you are full. If you do end up overindulging, avoid beating yourself up. Guilt is toxic and damaging. Instead, understand that slip-ups during the holidays happen to everyone. Focus on the positive. Did you enjoy what you ate? Did you enjoy your time at the event or gathering? How are you feeling afterward? Gently remind yourself that now is a great time to reset, get back on track, and move forward. This simple trick works year round for keeping your energy up, staying hydrated, and diminishing cravings, but it is particularly helpful around the holidays. With errands, traveling, cooking, and perhaps a few too many cocktails, it is easy to end up with a serious lack of hydration. To stay adequately hydrated, carry a stainless steel water bottle with you at all times, and try to drink around 8 to 10 glasses of water each day. If possible, avoid or limit your alcohol intake. Not only does alcohol dehydrate you, but it also lowers your inhibitions (translation: it significantly increases your chances of making poor food choices). Most alcoholic drinks are also mixed with high sugar ingredients, making them especially rough on the body. As an alternative, ask for a sparkling water with lime or lemon. Another option is sparkling water with herbal tea or fresh juice added to it. If you do decide to consume alcohol, aim to drink at least 1 cup of water between any cocktails. Staying up late to finish prepping for a gathering or wrapping presents? Thinking it won’t hurt to stay extra late at a party? Think again. Sleep is essential year round, but especially during the hectic holiday season. Adequate sleep helps decrease your chance of getting sick, boosts your willpower, supports healthy brain function, and helps support a happier mood. Occasionally (okay, almost always) you will have a friend or relative that pushes you to indulge on the rich, heavy food and treats that accompany the holiday season. Although this can be tricky to navigate, it usually helps to say something like “I’m here for the people, not the food”. This typically is enough of an answer to shut down a food pusher without making them feel insulted.